Come Get Your Icehole Cooler! 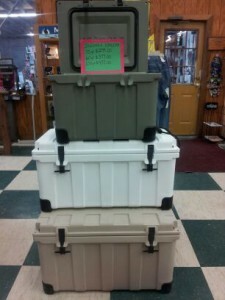 Lochte Feed & General Store is pleased to offer Icehole Coolers. These military grade coolers are the new standard in tailgating, hiking, camping, etc. Built to last for that long expedition or unexpected power outage, whatever you call that sporting equipment you use to hold ice – a premium cooler, a sports cooler, cool box, portable ice chest –ICEHOLE is better by design. Featuring interlocking non-skid feet, an exclusive freezer seal design, and latches from the M2 Bradley fighting vehicle, ICEHOLE is an investment in outdoor fun built to be tough. To prove it, every ICEHOLE Cooler comes with a limited lifetime warranty. These coolers are made in the USA. Icehole even went as far to test the product on the wildest of the wild…a Grizzly! Check out the Icehole vs Grizzly Bears video! This entry was posted on Monday, August 25th, 2014 at 10:57 am	and is filed under News & Updates. You can follow any responses to this entry through the RSS 2.0 feed. Both comments and pings are currently closed.